The first part presents discrete models, including a bikeshare system and world population growth. The second part introduces first-order systems, including models of infectious disease, thermal systems, and chemical kinetics. The third part is about second-order systems, including mechanical systems like projectiles, celestial mechanics, and rotating rigid bodies. Taking a computational approach makes it possible to work with more realistic models than what you typically see in a first-year physics class, with the option to include features like friction and drag. 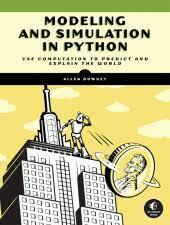 Python is an ideal programming language for this material. It is a good first language for people who have not programmed before, and it provides high-level data structures that are well-suited to express solutions to the problems we are interested in. Allen Downey is a Professor of Computer Science at Olin College of Engineering. He has taught at Wellesley College, Colby College and U.C. Berkeley. He has a Ph.D. in Computer Science from U.C. Berkeley and Master's and Bachelor's degrees from MIT.